Special Pre-Thanksgiving Tasting, at Bin 41 on Tuesday, November 20th from 6 to 7:30pm with Erin of Small Vineyards. For Small Vineyards fans, it’s that time of year when we receive our fall Direct Import wines (DI). The story behind the DI wines is that they come from small producers where annual production is too limited to keep them in stock year round. We try through the wines in summer and place our order…then wait for them to arrive. This year, we selected a handful of delicious reds perfect for holiday entertaining because they are delicious but also affordable. Many of them will pair beautifully with Thanksgiving cuisine, so Erin has agreed to swing into the bin to give you an early preview. Stop by during the tasting and give them a try…these affordable wines typically don’t stick around in stock very long! 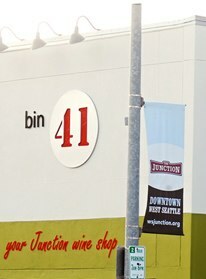 Bin 41 is located at 4707 California Ave SW, Seattle, WA 98116 in The West Seattle Junction.